Factoid: after water, tea is the most frequently consumed beverage in the world, to the tune of 3 billion cups per day. The most prolific sippers? The Irish, followed closely by the British. While my very English aunt will tell you that tea wasn’t tea until the British came along, she is so wrong. Eastern nations including Russia, China and the Middle East have been drinking tea for upwards of 5,000 years. The English? Not more than 400. Sorry Auntie! Historically, tea was, like many other commodities, a currency in and of itself. In fact, tea was used AS currency in Siberia, as recently as the early 1800s. Fascinating, right? Factoid: The ‘tea bag’ as we know it was invented in the USA, much the chagrin of authentic tea drinkers worldwide. The invention was purely accidental: “In around 1908, Thomas Sullivan, a New York tea merchant, started to send samples of tea to his customers in small silken bags. Some assumed that these were supposed to be used in the same way as the metal infusers, by putting the entire bag into the pot, rather than emptying out the contents.” (Source). Mr. Sullivan went on to manufacture the ‘gauze’ tea bag, which is much the same today as it was in 1920, complete with string and tag on the end. 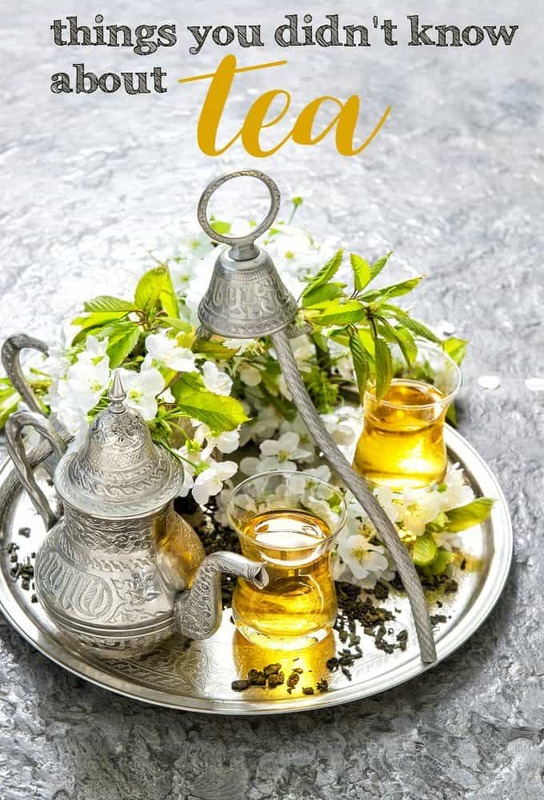 Although there are different types of tea including black tea, white tea, oolong and green tea, to name but a few, they ALL come from the same plant: camellia sinensis. The distinctions in flavour between the different types are created in the processing, amongst other things. And your favourite herbal tea is not, I’m sorry to tell you, tea at all, but rather a selection of herbs and flowers. Loose tea makes the ideal cuppa―stored in an airtight container, in a cool, dark place. You can use individual strainers or a French press for a perfectly brewed cup. The idea is that the leaves are whole, not crushed as they are in the bags, rendering a fuller and more complete flavour. That said, almost 97% of tea drunk today is via the little white baggies, so convenience trumps taste! The darker the tea, the hotter the water should be: 62 degrees for white or green teas; 100 degrees (boiling point) for black teas. Steeping time is up to the individual drinker but an average is about three minutes. The first time I encountered the term ‘elevenses’, it was while reading the Hobbit. A quick post-breakfast, pre-luncheon cup of tea and a nibble. How very civilized! For the Irish and English, tea drinking only ends in the evening, to be most often replaced by the other favoured brew: beer. If you want to have tea, say around 4 p.m., with light snacks and cakes, you are having ‘afternoon tea’. A silver tea service is not required, but this famous little break is often and improperly confused with ‘high tea’, which is an actual meal served with a pot of strong, fortifying tea. The former was derived by the upper classes and specifically by the Duchess of Bedford, who could not abide the long stretch between lunch and dinner (commonly served around 8 p.m. in England). High tea was the purview of the working class, who couldn’t take a break for dainties at 4 p.m. and therefore needed to go directly to their full meal, after work. Tea grown in the Darjeeling region of India is considered to be the ‘champagne’ of teas. 10 million kgs of the tea are grown annually but 40 million kgs are sold, worldwide. So like the Champagne region of France that seeks to crack down on less reputable ‘copies’ of their delectable nectar, Darjeeling is trying to find the sources of mislabeled blended teas that just aren’t quite up to standard. You can do as Professor Trelawney does in Harry Potter and read the leaves. Just stir what remains in the bottom of your cup three times. All joking aside, tea leaf reading is considered to be a respected art in parts of Asia. For the rest of us who don’t have the gift of ‘sight’, a far more efficient use of the remains in your press would be to leverage the anti-inflammatory properties they contain on bug bites or puffy eyes (THIS would help with sight!) and fertilize your plants, particularly the rose bushes, with them. Before you go, check out these 8 tea subscription boxes for Canadians. Do you feel like you know more about tea than you ever thought possible? I’ll bet someone has a tidbit to share! Let me know if you have an interesting tea fact or a favourite tea based recipe! I drink tea any time in the day! Some times a nice orange pekoe tea with a bit of milk or a nice green or herbal tea black/ on its own or with a tiny splash of honey! I love that it can have so many health benefits too! My Mom drinks a pot of tea a day.None of us kids ever became tea drinkers. I absolutely love tea and I would definitely use it as currency today haha! When I was younger, my grandma used to make iced catnip tea. It was wonderful and one of my favorite things. Now that I’m older and love HOT teas more, I am always on the lookout for teas with catnip as one of the ingredients. Not only do I find it just tasty, but I think it’s soo relaxing. A former doctor even said it may help with my migraines but I’ve never really been able to tell if that’s true or not. That picture of the tea tray is like idea. I like tea a lot. I also like the visual appeal, so I’ll pick the cup that I’m in the mood for, I’ll use the tea kettle that I’m in the mood for, use my favourite stirring spoon if I use sugar or milk. I do love my cup of tea to feel refreshed.These are some interesting facts about tea that I was glad to read about. I’m not a fan of Tea but these facts are pretty interesting! I had no idea about the temperatures based on the tea! Thanks for sharing this pretty cool information! My dad was a tea drinker and mum was for coffee. My twin was a tea drinker and I’m a coffee drinker, some do drink both but not in my family. My brother was also a coffee drinker – and we were all English. I love a good cuppa. About 2 years ago, we switched to loose tea and wow, what a differrence. I still use the bags, because they are just so handy. Love to experiment with all the different teas. Never thought of cooking with it though……now that might just be lovely to infuse some biscotti or maybe shortbread??? We all drink tea in this household. Must be the English thing as really like it with fish and chips. I’m the only one though that drinks it black, no sweeteners, milk or cream of any kind. I didn’t know that tea had only been around in England for 400 years, or that the teabag was developped by accident! Neat! Thanks for sharing all this info about tea most is new to me,i love tea and drink 5/6 cups a day. Didn’t know much at all about tea, but now I know a bit! Love afternoon tea it is so refreshing. I don’t drink tea because the caffeine cause heart burn but I love Herbal tea it doesn’t have the caffeine. Interesting facts. I’ve never been a tea drinker although my mom and dad always had tea at lunch and supper. Hubby likes an occasional cup of tea. I loved reading these facts. I am a big fan of tea but I especially love green tea and black tea. I am one who gravitates towards tea bags over loose tea leaves because of convenience as well, but I know you can also buy disposable filter bags for your loose tea, so I guess I really don’t have an excuse! A tea subscription box would be a lot of fun! I’m Indian so tea is literally in my blood… It is literally steeped into every aspect of my culture including the colonial British influence from East Africa. There are many amazing medicinal properties to tea; my family has used steeped tea leaves for disinfecting cuts and wounds for hundreds of years, to cleanse eyes when you have an infection, to gargle when you have a sore throat. Its pretty amazing.